St. Martin's Griffin, 9781250036100, 384pp. Given his line of work in the employ of a psychotic Brooklyn crime boss, Trent finds himself on the wrong end of too many bullets. Yet each time he's killed, he wakes a few minutes later completely healed of his wounds but with no memory of his past identity. What's worse, each time he cheats death someone else dies in his place. Sent to steal an antique box from some squatters in an abandoned warehouse near the West Side Highway, Trent soon finds himself stumbling into an age-old struggle between the forces of good and evil, revealing a secret world where dangerous magic turns people into inhuman monstrosities, where impossible creatures hide in plain sight, and where the line between the living and the dead is never quite clear. 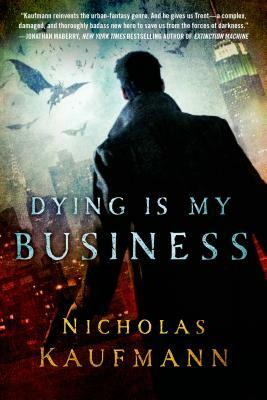 And when the mysterious box is opened, he discovers he has only twenty-four hours to save New York City from certain destruction, in Dying Is My Business by Nicholas Kaufmann. NICHOLAS KAUFMANN is the author of Dying is My Business. He lives in Brooklyn, New York with his wife and two cats—one of which has special needs, the other of which only pretends to.